A few years ago, my colleague returned from her business trip to Bogota, the capital city of Colombia, and mentioned that she was accompanied by at least one bodyguard whenever she ventured out of the hotel. My recent visit was unplanned, and in place of a bodyguard, I spent a day touring the city with a personal guide and a driver recommended by the hotel. 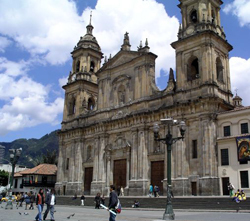 Bogota turned out to be such a delightful stop that it has since become one of my favorite destinations on Earth. The display of pre-Hispanic goldwork—the biggest collection in the world—at the Museo del Oro Gold Museum offers a scintillating feast for the eyes as well as an invaluable introduction to Colombian history prior to the arrival of the Spaniards. The countless gold pieces, intriguingly arranged to create artistically aesthetic patterns, magnificently showcase the practical and spiritual lives in pre-European Colombian societies. Colombian artist Fernando Botero’s paintings are familiar and reproduction posters ubiquitous. But only at Museo Botero, a living artist’s museum situated in the charming Candelaria district, can you fully immerse yourself in the thought-provoking, yet serene and sometimes unfathomable, realm of “large people.” Botero designed the museum to house both his own works, including “the Family” and the inflated “Mona Lisa,” and remarkable pieces by other artists from his treasured collection. The museum’s courtyard is quite enchanting as well. It may not be easy to pinpoint what exactly makes the Bolivar Square so distinctively South American. The statue of the Liberator Simón Bolívar? Or the conspicuous structures such as Primate Cathedral, Justice Palace and National Capitol surrounding the square? It could also be the gregarious Spanish-speaking visitors from other South American countries. The aura of the area originates from a potpourri of aboriginal and Western cultures, of equanimity and revolution, and of modernity and antiquity. 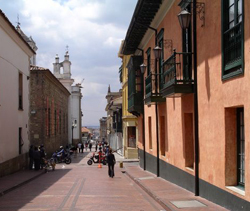 Verdant, organized and pleasant are a few adjectives that come to mind when I am asked to describe my very first impression of Bogota, a city established on a high plateau. You’ll still see soldiers carrying guns stationed at street corners, and even on rooftops, but like the city’s residents, they reveal their hospitality and amiability naturally with their smiles, and you can’t help but smile back.